The Business Case for Records Management identifies the goals, scope, and complexity of the records management program project. The records management strategy includes the benefits, costs, resource requirements, and justifies moving forward with the program. This is basically a proposal template for making a case for implementing a Records Management Program. your excellent customer service and the Proposal Pack did obtain the big contract I bought it for and many more. Now my client is so happy with my services that they want to put me on a retainer." This Business Case for Records Management is included in an editable format that can be customized for your own needs. How do you write a Business Case for Records Management document? An executive summary should present the highlights of your proposal in concise language and should present information in the same order as it appears in your proposal. Some reviewers may not read beyond the executive summary, so ensure that the information you provide is easily understood, sounds attractive to the reviewer, and accurately represents your ideas. Save technical language and detailed information for other pages within your proposal. Include a purpose statement that covers the problem and the central idea. This shows the reviewer that you have thoughtfully considered the specific issues. Restate the client's needs as determined by reading the RFP or reviewing your previous interview notes. Insert need # 1 statement here (e.g., " Reduce the amount of records stored and storage of duplicate documents" ). Include the major points of analysis and identify the opportunity. Restate the client's goals you identified previously (via RFP, interview, etc.). Insert goal # 1 statement here (e.g., " Develop a central records repository" ). Insert a description of the present situation. This could be a description of the present state of your company (for example, " A program assessment was performed to gather sufficient information to enable management to determine whether or not to proceed with upgrading the existing Records Program and to identify technology that may help with Company Name's goals" ). Describe how the present situation is expected to change. The Current Environment of Records and Information. Describe how your proposal is related to the present situation. Describe the needs in the present situation that are not being met and that your proposal will fulfill. Describe the potential future situation if the project is accomplished. A preliminary SWOT (Strengths, Weaknesses, Opportunities, and Threats) Analysis of Company Name's business highlights the following strengths and opportunities that can be further leveraged or exploited, as well as pointing out weaknesses and threats to be managed. You can expand on each major topic of the analysis using the additional Strengths, Weaknesses, Opportunities, and Threats templates. Strengths and weaknesses are internal factors, while opportunities and threats are external factors. Performing a detailed analysis can help you determine a course of action best suited for the client. For more about SWOT Analysis, search the Internet for additional information and tools. A detailed analysis of Company Name's strengths is included later in the Strengths section. A detailed analysis of Company Name's weaknesses is included later in the Weaknesses section. A detailed analysis of Company Name's opportunities is included later in the Opportunities section. A detailed analysis of Company Name's threats is included later in the Threats section. The following project requirements will be met to the satisfaction of Company Name. The requirements will cover all aspects of the project. Insert the general requirements of the project to be delivered. Examples include: performing to a set of standards, performing to a set of metrics, performing the required functions, system requirements for specific hardware and software needed, all deliverables being met, all contract terms being met, deadlines being met, etc. Description: All project deliverables must be delivered and perform to their specifications. Insert summary of all deliverables required. Reference any other sections in the proposal where detailed deliverable information is outlined. Description: All contractual obligations must be met as outlined in the contract and addendums. Insert summary of all contractual obligations to be met. Reference any other sections in the proposal where the contractual obligations are outlined. Note that the entire proposal and everything listed in it may be considered part of the contract. Description: All required documentation and training must be complete. Insert summary of documentation and training to be completed. Reference the appropriate detailed sections such as the Documentation Specifications, Training Plan, etc., for more details. Description: All system requirements must be met. Insert summary of the system requirements here. System requirements include hardware platforms, configurations, software programs, etc. Description: All functional requirements must be met. Insert summary of the functional requirements here. Functional requirements include all of the major functions the project is to be able to perform when complete. You can also reference other sections, such as the Interface Specifications. Description: All performance requirements must be met. Insert summary of the performance requirements here. Performance requirements include such things as performance metrics, bandwidth, operation speed, maintenance, etc. Describe all of the resources that will be used on the project. Implementing a Records Management Program requires involvement from internal and external resources. The records management systems will affect everyone at Company Name at some level, and therefore the solution will require more support and resources from the organization than most other types of projects. The following is a list of resources and the roles within the Records Management Program. Records Management Role Records Management Program Responsibilities. Develop a file plan. Develop classification schemes. Select and install software and hardware. Perform migration content from legacy applications. Assist on decision for how far to go back with historical documents. Analysis of potential risks is outlined below. This list of risks is not necessarily a complete list of all possible risks. No guarantee is made that all possible risks have been determined, or if determined, that the analysis is completely accurate. The need for risk management and oversight of the operational impacts of the new Records Management Program should be studied and documented. Insert your assessments of possible risks to the project and client here. For example, if the project depends on the services of a third-party company, a possible risk would be that the vendor could go out of business. A contingency plan would be to have an additional source available to replace that vendor. Analysis: Insert description of the potential risk here, why it is a risk and how great a risk it may be. Resolution: Insert description of how you intend to account for this possible risk in the project design. Contingency: Insert description of possible contingencies that can be planned for in the event the risk becomes a reality. Supporting the development of a Records Management Program requires that Company Name formally assess risk and prepare for potential issues and create strategies for addressing them before there are problems. Analysis: Insert description of the potential risk here, why it is a risk and how great a risk it may be. Resolution: Insert description of how you intend to account for this possible risk in the project design. Contingency: Insert description of possible contingencies that can be planned for in the event the risk becomes a reality. Records Management is a cost center and cost savings may be difficult to measure. Increased productivity is often the key component of the financial justification for developing or improving a records management program. As stated earlier, the amount of resources needed to develop the Records Program may take away from the primary work activities of the business and the savings in time and effort in records care may not be immediate. If you have detailed cost/benefit analysis data, tables, graphs, graphics, output from Cost/Benefit Analysis software, etc., include it here. Include the total project cost for a time period and the total income expected to be generated and/or saved during the period. This can be converted into the expected ROI (Return on Investment) of the project. You should be able to show that the ROI is high enough to justify the project. If monetary ROI is low, then the benefits should be tangible enough to show a valid reason for developing the project. The Total Costs are the total cost of production, operations and on-going maintenance. The Benefits are the financial benefits to the customer such as income generated, cost savings, etc. The Net is the Benefits minus the Costs. The Ratio is the net divided by the Costs. The ROI is the Ratio times 100. For example, Total Costs for a year are $10,000. Total Benefits for a year are $15,000. The Net is $5000. The Ratio is .5 and the ROI is 50%. Reducing licensing and operational cost of maintaining multiple repositories. Develop records training programs to increase worker productivity. Records Management is necessary to maintain a competitive edge. New policies will streamline current processes in increase productivity. Increase information management and security. Training Change Management Communication Consulting Implementation of ECM Hardware Software Technical Support Administration Records Management Full-Time Employee Running Costs (including licences) Migrations Total Cost Benefits of the Records Program Licensing Employee Productivity Storage Litigation and Audit Control Business Process Automation Total Benefit Cost / Benefit Total Costs Total Benefits Net Ratio ROI. A summary of the Records Management proposal follows, including identified needs, recommendations and goals to be achieved. Insert statement of why you are the best choice for achieving the goals outlined. The Conclusions template outlines the project. It should be brief - no longer than two or three paragraphs. Use your needs, recommendations and goals to build this section. The Conclusions section is a restatement of the Executive Summary or Abstract and ties together once again the major points of the proposal and asks the prospect to take action. You can also add the Recommendations template to expand on your recommendations and action items in more detail. Like writing a book, a proposal should tell the audience what you are going to tell them (the Executive Summary or Abstract), tell them the details (the various templates available to include as you see fit), then tell them what you told them and ask the client to take action (the Conclusions section). Insert summary of desired outcome. The Conclusions section is most useful if developed after the rest of the proposal. It must encompass all the key summary points necessary to communicate the objectives of the project. 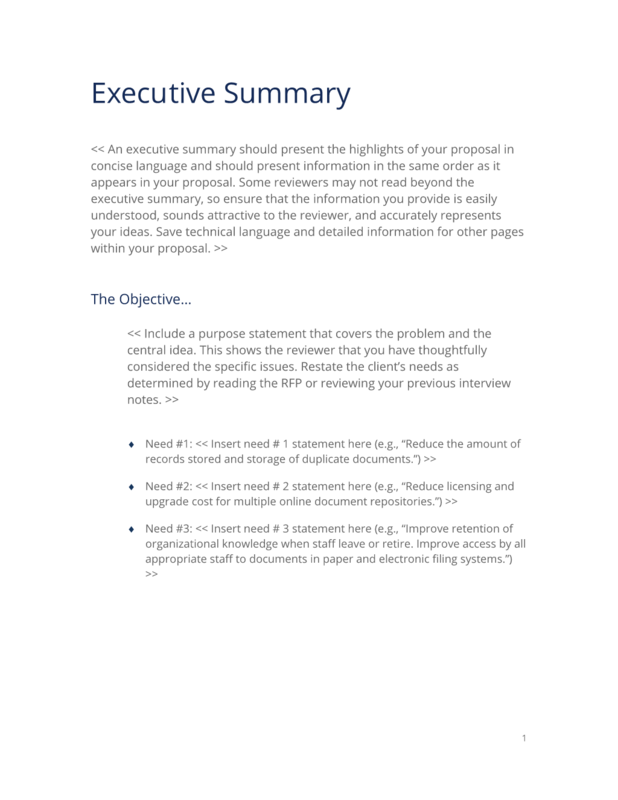 In many cases, the Executive Summary or Abstract template is used to introduce the proposal, then detailed sections of the proposal follow, using the various templates included in Proposal Pack. The Conclusions template may be included to summarize once again at the end. The introductory summary or abstract will usually be the first part of the proposal package seen and often is the only part that is carefully reviewed before the decision is made to consider the project any further. The editable Business Case for Records Management document - complete with the actual formatting and layout is available in the retail Proposal Kit Professional.